Is a self taught professional photographer. Photography became a passion for Paul when in his early 20's he received his first SLR camera as a birthday gift from his wife. What started as a hobby quickly became a new career. Paul has been teaching and sharing his photographic skills in a classroom environment for over twenty years. He relocated to Muskoka 21 years ago and has enjoyed discovering the beauty it has to offer a photographer. Pauls' love of nature has enabled him to pass on his creative and technical knowledge through his workshops. Paul is a successful Commercial, portrait and landscape photographer with a studio and gallery located in Muskoka Lakes Township. 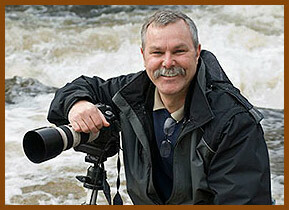 Seven years ago he founded the Muskoka Photography Club which now boasts over 50 members.